Jute is one of the most valuable resources of India, and is extremely versatile fibre. Thus, used for various uses such as rigid packaging in the form of sacks, bags, fabrics, etc. The jute bottle bags have become very popular among people of all ages across India as well as abroad and are one of the popular types of Jute Bags. These bags are also available in multitude of colors and are carefully developed as well as finished to have high utility value. Possessing high material strength and durable in nature, bottle jute bags can be manufactured in different designs and with or without a transparent window to show the bottle. Usually, these bottle bags are available in different types like wine bottle jute bags, single bottle jute bags, 2 bottle jute bags, 3 bottle jute bags, 6 bottle jute bags and come with a plastic window. 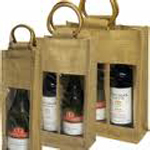 Quality range of bottle jute bags is also used to carry wine bottles. The wine bottle jute bags can be gifted to your relatives, friends and acquaintances on particular occasions. It not only works as a carry bag but also exhibit artistic & aesthetic appeal. There are various sizes of Jute Bottle Bags available in the market that meet the ever changing demands of buyers. Superior in terms of quality, patterns and designs, these jute bags can also be used to keep more than one bottle in a safe manner. Also, the bottles of various heights can be accommodated in the bag as it comes with adjustable handles. Moreover, jute bottle bags also have removable compartments so that they can be utilized for shopping purpose. Their manufacturing cost is low as compared to the bags of other material and hence, many people in the handicraft sector prefer jute bag production as their business domain. Send your query for any requirement regarding bottle jute bags, wine bottle jute bags, single bottle jute bags, 3 bottle bags, 6 bottle bags, multi bottle jute bags, bottle jute bags, etc.